The ETRC has designed four prototypes which illustrate a new level of building integrated photovoltaics(BIPV), allowing BIPVs to interact with the building in ways never previous explored. The construction of the prototypes was made possible with the help of many generous sponsors such as BP solar, True North, Sun Power and Diamondclad Power. The following is a description of the prototypes. The solar awnings prototype presents a design which transforms a common building attribute (i.e. an awning) into an energy producing device, without any adaptation to the bulding's prior structure. The solar awnings elegantly serve a dual purpose, not only blocking the sun rays from occupants, but harnessing solar energy for functional use. The multi-functionality of our prototype allows more of the building's rooftop space to be utilized. The flexible solar roofing replaces normal roofing in all aspects(waterproof, durable) while eliminating the need for additional frames to house the solar panels. Our prototype allows to create an urbeach (urban+beach), where residents coexist with renewable energy devices to create an enjoyable, relaxing environment. 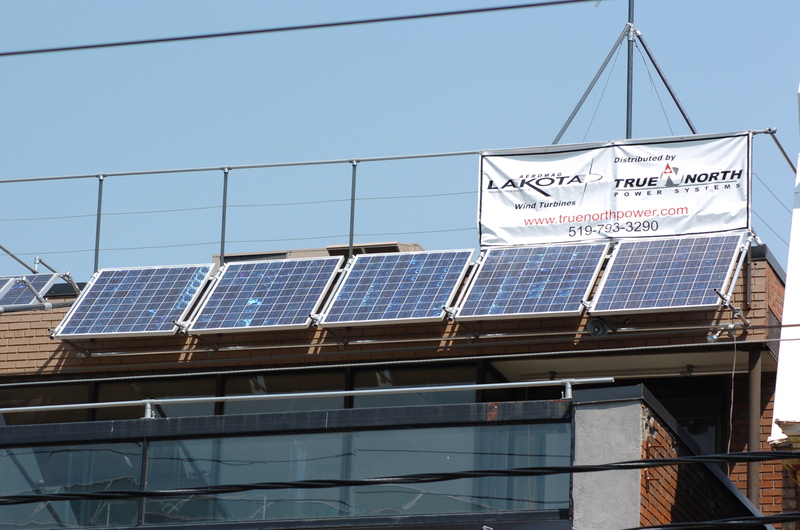 The panels provide a safe and accessible energy supply, facilitating the use of many 12V appliances such as radios and fans from the rooftop and eliminating the need for extension cords or batteries. 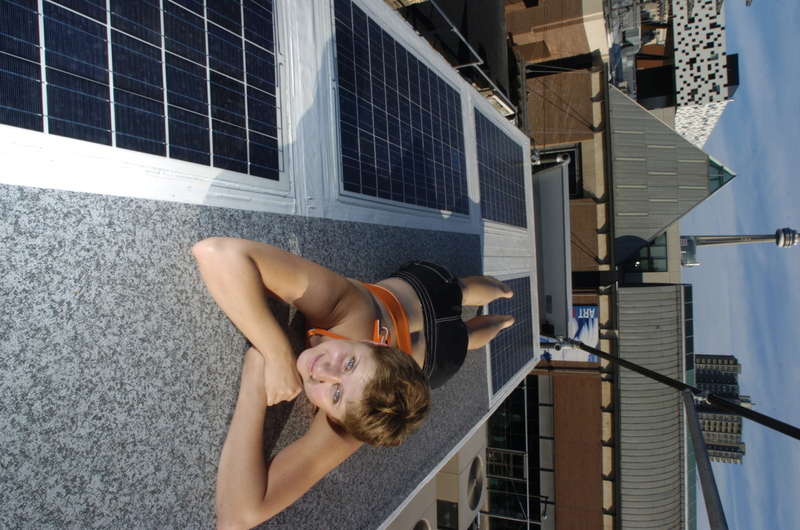 This improved image of solar energy increases its market value and attracts more consumers. We believe that this is a necessary step, bringing renewable energy in Canada on a par with that offered in other countries around the world. The solar outdoor labspace was found to meet several needs of the ETRC, both for summer and winter climates. The prototype was found to provide an enhanced working environment for the students of the ETRC, allowing them to enjoy yhe beauty of Toronto's city scape, not to mention a sunny day, while completing their projects. The labspace, capablt of holding two students, eliminated the need for extension cords or batteries for equipment while working on the rooftop. 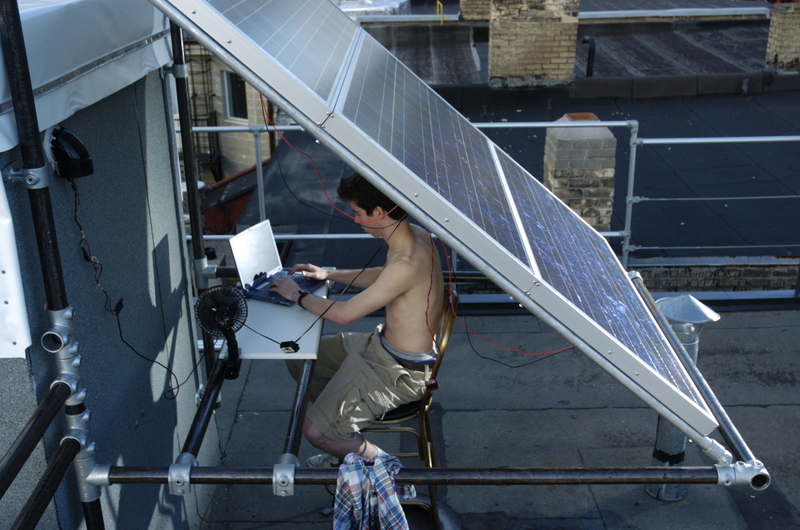 The solar outdoor labspace additionally provides the ideal working environment for rooftop data acquisition in a Canadian winter climate. The solar louvre prototype allowed us to explore the field of solar sculptures, pieces of art which effect emotion through aesthetics or symbolism, but also through functionality. The telescoping bars within the frame of the solar louvre allowed the angle of inclination of the panels to be adjusted according to the time of year. This ensured that the angle of incidence of the sun's rays hitting the panels was as close as possible to 90 degrees. It seems only fitting that the solar louvre at the ETRC is situated directly across from the entrance to the Art Gallery of Ontario(AGO), one of Canada's largest art galleries.